Summary: When a child takes a book off the shelf and begins to read, he learns a lot about elephants. Much of the book is nonfiction, giving facts and information about elephants, including the different species, their size, what they eat, their habitat, and why they are endangered. The child appears in some of the illustrations, and there are connections to his world, like the picture that shows four cars piled on top of each other that are equal in weight to a male elephant. 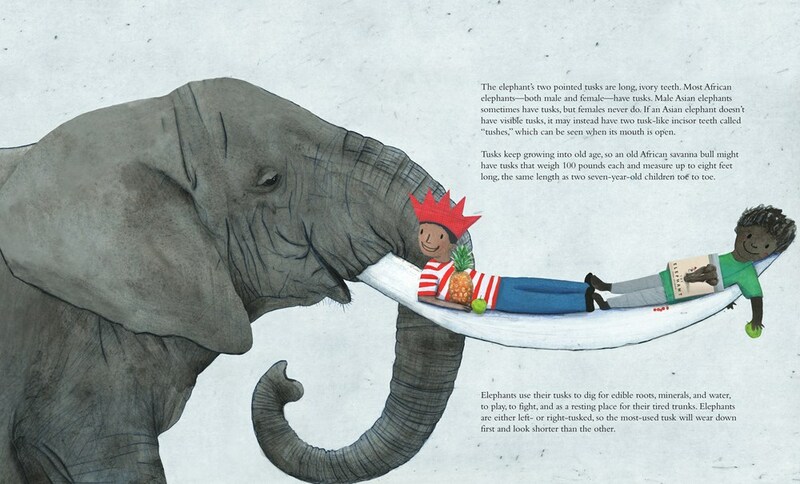 Although elephants sleep a lot less than most other mammals, the same is not true for the reader, and the final page shows him asleep in his dark house, his head pillowed by the elephant book. 48 pages; grades K-4. 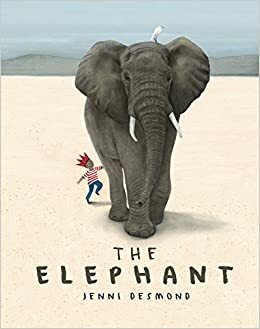 Pros: An appealing nonfiction book, with the whimsical illustrations adding some humor, but also informing (the car picture, the one above that shows the length of an elephant’s trunk with two children lying on it toe-to-toe). Jenni Desmond has written similar books on polar bears and blue whales, which I am now looking to add to my libraries. Cons: There is no back matter–some additional resources would have been useful.